I’m not French-Canadian, but the town where I grew up is in northern Vermont and on most nights you could see the bright lights from the Canadian border crossing just a few miles up the road. When I was on the high school Nordic ski team, we’d drive up to Quebec City each year for preseason training. Two things I’ll never forget from my first trip there: seeing an otherwise super-fit, super-healthy skier stop in the middle of the trail to take a cigarette break, and the poutine. Poutine (pu-teen)—fries topped with gravy and cheese curds—is a French-Canadian classic. But until that point, I’d only ever seen it at diners and fast-food restaurants, not in a Nordic ski-center cafeteria. When my typical post-training snack included such healthful components as water, a granola bar and clementines, poutine seemed an unlikely menu option for a group of teenagers who had just worked out all day. But in retrospect, I think it’s kinda genius: packing a plateful of filling carbs with some delicious salty protein for staying power. Truthfully, though, poutine really is just glorified fast food. And most people aren’t consuming it as a reward for cross-country skiing 20 miles. Which is why I was thrilled when the EatingWell Test Kitchen developed this version for the latest issue of EatingWell Magazine. 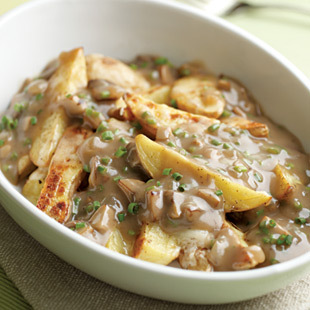 You can make it healthier at home by oven-frying the potatoes and topping them with grease-free gravy and just a touch of extra-sharp Cheddar cheese. C’est si bon! Have you ever tried poutine?